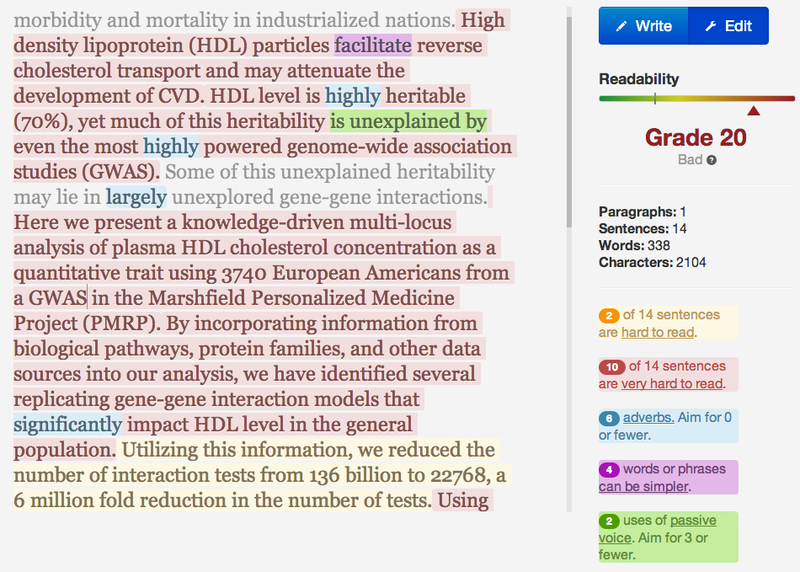 I recently found this little gem of a web app that analyzes the clarity of your writing. Hemingway highlights long, complex, and hard to read sentences. It also highlights complex words where a simple one would do, and highlights adverbs, suggesting you use a stronger verb instead. It highlights passive voice (bad! ), and tells you the minimum reading grade level necessary to understand your writing. When I pasted in some text from an abstract I submitted to ASHG years ago it showed me just how terrible and difficult to understand my scientific writing really is. My abstract text, which should have been hard-hitting and easy to understand at a glance, required a minimum grade 20 reading level. The majority of my 14 sentences were very hard to read and littered with too many adverbs, complicated words, and several uses of passive voice. (I still got a talk out of the submission, so maybe we as scientists enjoy reading tortuous verbiage...). It looks like a desktop version is in the works, but the web app seemed to work fine, even for a 100,000-word manuscript I tried. Microsoft Word has had a similar feature for quite some time -- such automated tools are interesting, but some things the tools complain about (such as passive voice being bad) are more or less superstitions -- there is nothing wrong about saying that much of heritability is unexplained by GWAS despite being passive -- saying it in active voice -- (that GWAS fail to explain much of heritability) isn't really any clearer.